Many chefs around the world choose carbon steel knives because they are sharper than stainless steel knives. They are easier to sharpen as well. 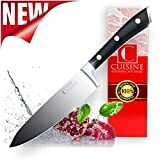 You can find a good carbon steel knife for use in the kitchen at an affordable price. 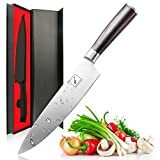 All of the knives on this list, except for one, are under $50. We ranked the best carbon steel knives for use in the kitchen based on customer ratings, versatility, ergonomics, and quality. The Iron King High Carbon Steel 8″ Chef Knife is razor sharp with an ergonomic handle. You can effortlessly cut, slice, and dice vegetables and meat with the chef knife. It’s easy to clean because the blade doesn’t have crevices that trap food like some knifes do. A durable knife, the Iron King High Carbon Steel Professional 8″ Chef Knife doesn’t corrode. It comes in a protective case to maintain the blade’s sharpness as long as possible. This knife is made of high quality high carbon German stainless steel. The handle is made of Pakka wood to provide comfort and security while using the knife. Its shape helps prevent wrist fatigue, finger numbness, and slippage. Iron King offers full refunds for anyone who isn’t happy with their purchase. Due to a lot of high customer ratings, it’s one of the best carbon steel knives. Made of high carbon German stainless steel and an ergonomic handle, this knife is one of the best carbon steel knives for the kitchen. You can easily cut through produce, meat, and cheese with the super sharp, well-balanced blade. The Cuisine Professional 8 Inch Chef Knife can seamlessly execute chopping, mincing, dicing, and slicing. 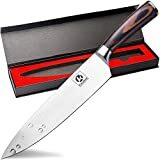 You can save money on sharpening this chef knife as it comes with a sharpener. The blade has excellent sharpness. It doesn’t take much force to complete prepping tasks like mincing garlic. The Cuisine Professional 8 Inch Chef Knife has an ergonomic, non-slip handle that helps prevent injuries. Its blade is resistant to rust as well. A money back guarantee and 25 year warranty come with high carbon chef knife. A lot of knives in its class contain 0.3% carbon. But the Kacebela 8″ Carbon Steel Chef Knife has 0.6%-0.75%. This carbon steel knife is two times harder than many knives in its class. On the Rockwell hardness scale, it rates 58-60. It’s suitable for cutting flesh off of bones as well as slicing, chopping, cutting, and dicing. The ergonomic handle helps prevent finger numbness. Customers find the weight and size of the knife well-balanced. The knife edge is ground to an exacting angle that maximizes cutting performance. It helps the knife last longer before needing sharpened too. The knife comes with a lifetime guarantee. The Imarku Pro Kitchen 8 inch Chef’s Knife comes with herb scissors, a cleaning comb, and a gift box. With an ergonomic handle made of Pakka wood, it helps prevent hand strain. Pakka wood is also waterproof, and it won’t catch bacteria, split, or wear out like most wood does. You can cut precisely with little to no resistance with the Imarku Pro Kitchen 8 inch Chef’s Knife. The high carbon stainless steel blade consists of 0.7% carbon, which is above average. For an even harder blade, this R-Bell carbon steel knife is infused with chromium and molybdenum elements. Although the chef knife is ideal for culinary experts, it’s good for beginners and intermediates too. This knife is one of the best carbon steel knives that is handmade. 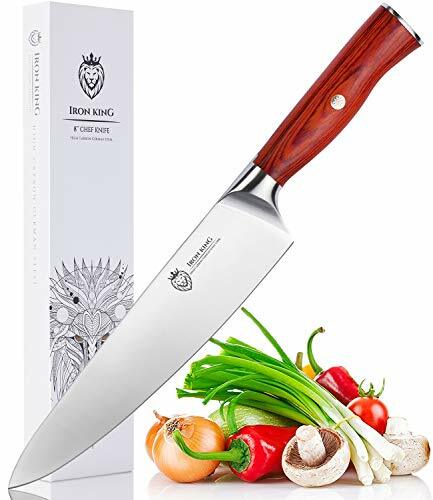 The Allwin Houseware 8″ Professional Chef Knife features HRC 62 Rockwell hardness and 67-layer High Carbon Stainless Steel. It’s made of premium Japanese VG10 damascus super steel and a Pakka wood handle. The carbon steel knife is comfortable to hold and doesn’t slip out of your grasp easily. Its 15 degrees super razor sharp edge can last six months or longer. 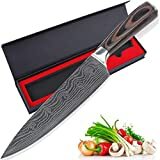 The Allwin Houseware 8″ Professional Handmade Damascus Chef Knife comes in a black gift box. 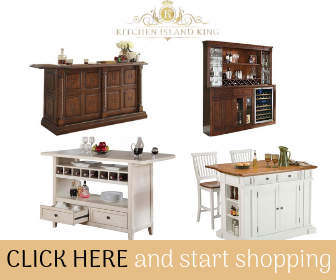 It’s ideal for novice home chefs, professional chefs, food caterers, and culinary experts. The knife can slice, dice, mince, and chop fruit and meat. Unlike some knives that need to be hand-washed, this carbon steel knife is dishwasher safe. It’s resistant to corrosion and rust. The blade has an interesting pattern for those who want a standout kitchen knife. 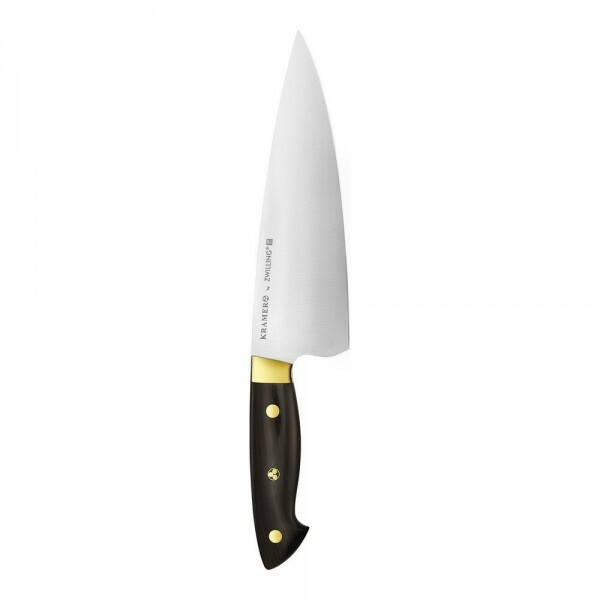 At the high-end, you have the Euroline Carbon Collection 8″ Chef Knife. Master Bladesmith Bob Kramer designed exacting specifications for this knife. It goes through a special oil-quenching hardening process and traditional three-step hand sharpening. The Euroline Carbon Collection 8″ Chef Knife features a double tapered blade and tang. It’s complete with a Bob Kramer mosaic pin and brass rivets. The handle is made of grenadile wood. And the blade is straight 52100 carbon steel. It has a Rockwell hardness of 61. 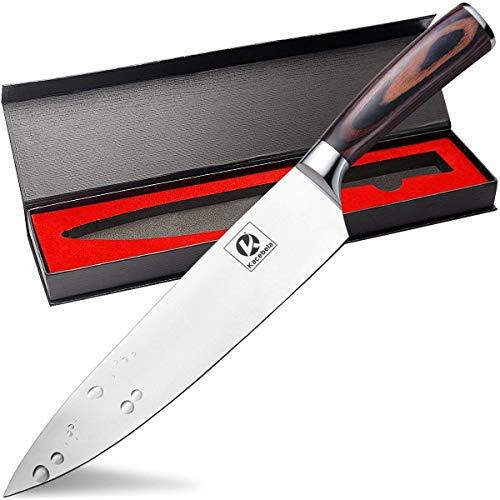 With outstanding edge retention and sharpness, the Euroline Carbon Collection 8″ Chef Knife is one of the best carbon steel knives. The blade on this knife is wide, making it easy for people with large hands to use. You could also use the wide blade to transport food while cooking. One of the best carbon steel knives with a unique design is the Augymer Professional 8 Inch Knife. It features a high carbon stainless steel razor shape blade and an ergonomic handle. You can slice, dice, cut, and chop with ease. With a cutting core at 58-60 Rockwell hardness, the knife is durable. The carbon steel kitchen knife has a slight curve that maintains a sharp edge longer. Made of Japanese high carbon stainless steel, it’s resistant to rust and corrosion. 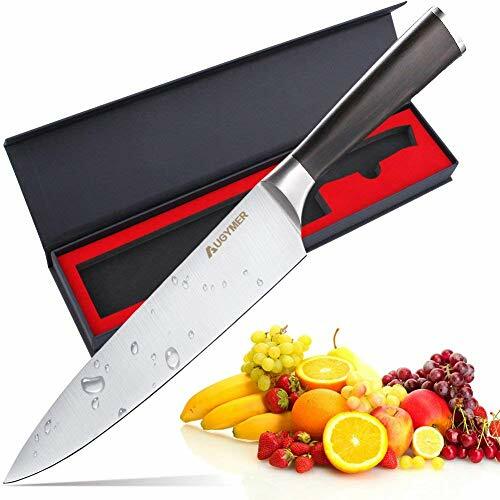 The Augymer Professional 8 Inch Knife comes in a gift box that you can keep for safely storing the knife. 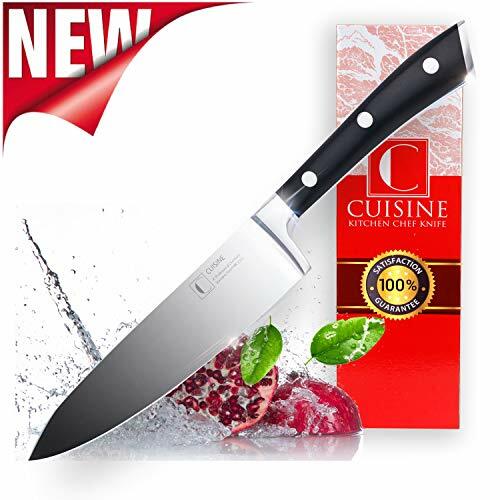 You also receive a lifetime warranty and 100% money back guarantee with a purchase of this carbon steel kitchen knife. When looking for a carbon steel knife to use in the kitchen, choose one with a sharp blade and ergonomic handle. Even if you don’t cook often, an ergonomic handle can stop you from accidentally dropping the knife. The seven knives listed above are all excellent choices. Which do you think are the best carbon steel knives to use in the kitchen? Let us know in the comments below.